Did you figure out the mystery insect from last week? The patches of mud you see on the trunk of the saguaro are made by desert encrusting termites (Gnathamitermes sp., probably Gnathamitermes perplexus). 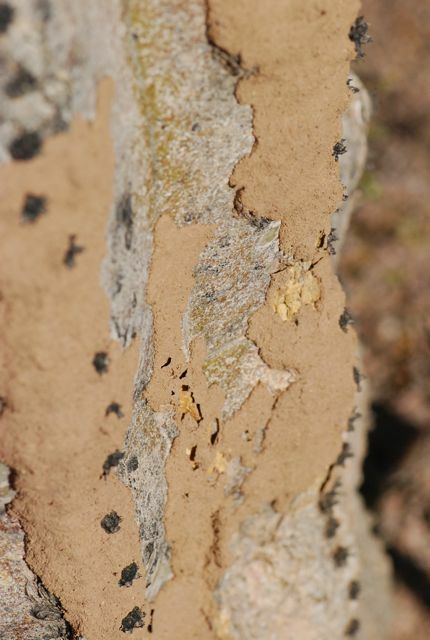 These desert termites build layers of mud on the bases of saguaros or palm trunks. They also plaster mud over dry grass or twigs on the ground, particularly after a rain. Over time they eat the grasses or twigs, leaving a hollow tube of dried mud. On trees, they gently scrape the surface clean of dead material. 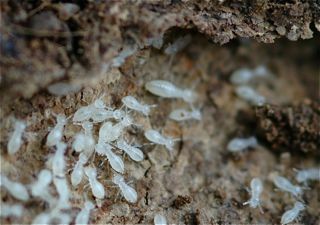 Desert encrusting termites are different from other termites because they do not enter or eat sound, strong wood. They could even be considered beneficial. 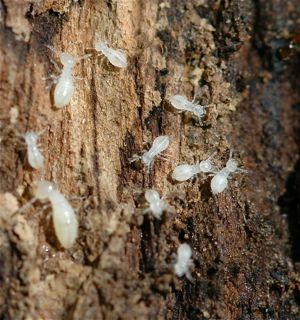 Have you ever heard that termites have protozoa in their guts to help them digest the cellulose in wood? 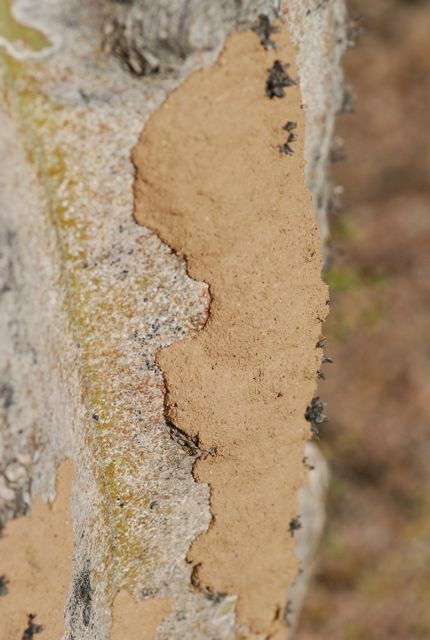 Desert encrusting termites have bacteria instead. Those bacteria are capable of fixing nitrogen, which means they actually fertilize the soil. Because the termites work on dry grass and twigs on the ground, they reduce fuel for wildfires. Finally, by tunneling in and moving soil, they aerate it, making it better for plants. 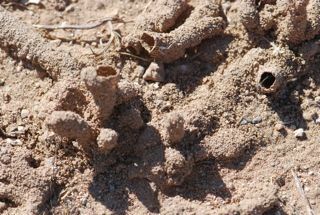 You could say that desert encrusting termites are part of nature's clean up crew. Before I get to bug of the week, did you get up to see the meteors? Weren't they incredible? I saw one particularly bright one shoot across the sky. Today I have a mystery for you. In these two photos, there is evidence of an insect. I'll give you a hint. This is the bottom of a saguaro cactus. Any ideas? The answer will be posted next Wednesday. I thought I would do something quite different for bug of the week today. How about a fun quiz to learn more about ants? When you are done, you can find the answers at my new Wild About Ants blog. Hope you have fun! How well do you know ants? Answer the following questions by selecting true or false. Better yet, stump your family and friends by giving them the quiz. 1. Some ants can explode when threatened by enemies, true or false? 2. Peony plants require ants for their buds to open into flowers, true or false? 3. All species of ants can sting, true or false? 4. Soldier ants are all males, true or false? 5. Ants can be used as stitches to close wounds, true or false? 6. Ants are silent, true or false? 7. 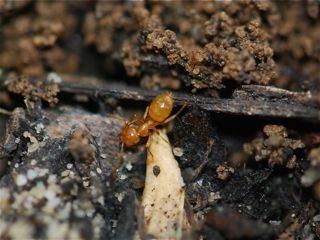 Ants plow more soil than earthworms, true or false? 8. Scientists who study ants are called antomologists, true or false? 9. Certain types of caterpillars eat ants, true or false? 10. Ants plant the seeds of many wildflowers, including violets, true or false? 11. Ants pollinate many types of flowers, true or false? 12. Ant larvae can make silk, true or false?